As long as #CarnitasGate isn’t raging, we’re usually pretty happy with our meat at Chipotle, which is a lot tastier than the questionably sourced stuff served by a lot of fast-food competitors. But Twitter user @fuckboybobby has some issues he wants to air out about Chipotle meat—not the quality, mind you, but whether they’re giving him enough of it. In the multi-tweet rant below, he calls out the chain for “meat finessing,” whereby employees will take chicken out of your burrito when you’re not looking. In retaliation, he claims that he makes a habit of stealing “forks, spoons, knives, and napkins” (aren’t those free already? ), as well as “hot sauce bottles,” because apparently he has taken the free market into his own hands. No one—not a corporation, not Steve Ells—will tell Bobby what he should get in return for his money. We’re not corroborating or co-signing this accusation, but we do hope that the phrase “finesse the meat” spreads far and wide. Have you ever been a victim of meat finessing, at Chipotle or elsewhere? 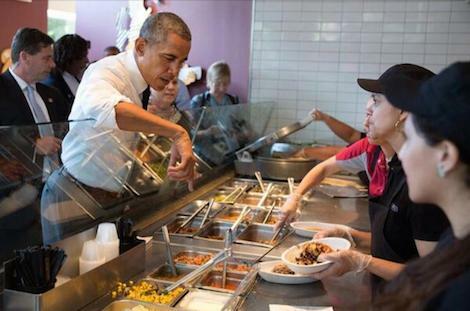 Our advice: If you want to avoid having your meat finessed, just do like Obama and take control of the situation—even if it involves committing the cardinal sin of disrespecting the sneeze guard.